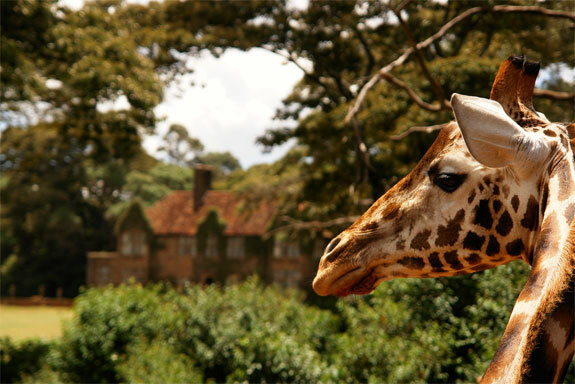 What’s more surprising, Giraffe Manor is located in the Langata suburb of Nairobi, only a 30-minute drive from the bustling center of Kenya’s capital (where a giraffe would be as out of place as in Trafalgar Square). 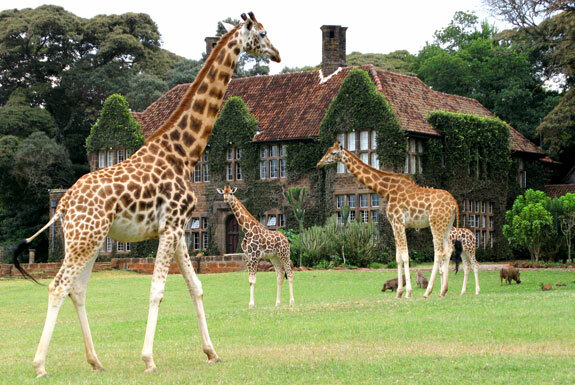 Of course, when Giraffe Manor was built as a private residence in 1932 Nairobi was not as bustling, or as large, as it is today. But over time urban encroachment threatened the natural beauty of the estate. 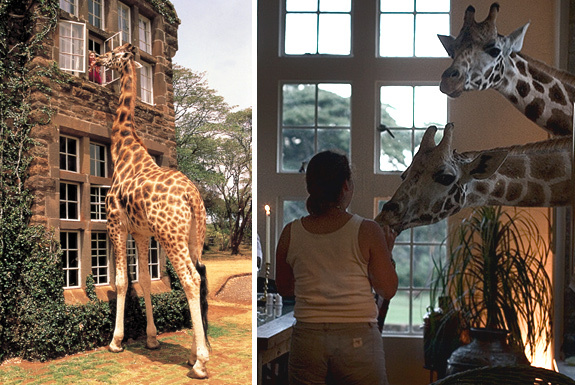 In 1974, the manor was sold to a family who turned it into a sanctuary for all giraffes, especially of the near-extinct Rothschild species. 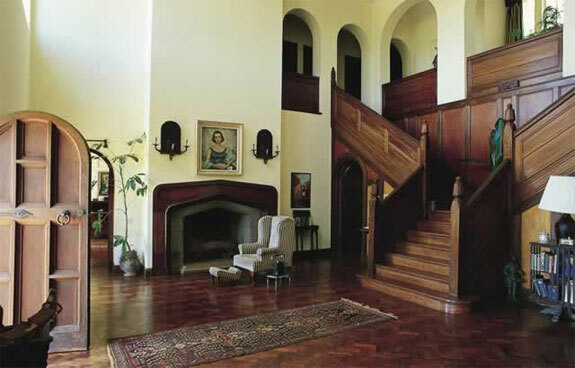 A decade later the family moved away and the estate was opened to visitors. Today, the six-room Giraffe Manor sits on 140 acres of wilderness that’s home to warthogs, Bush Bucks and all manner of birds as well as dozens of giraffe. 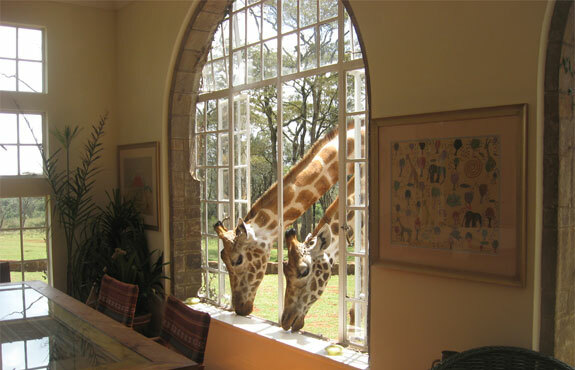 The Manor’s windows and doors are designed especially to allow the long-necked herbivores to peak in on—and get fed by—the estate’s human visitors. 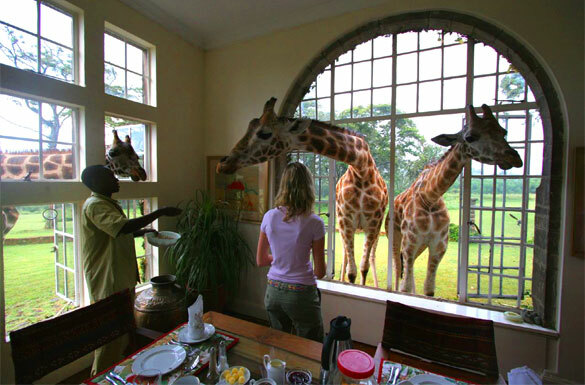 While enjoying your breakfast or reading a book in you room, expect to see a giraffe stick his head in through the window. The first time you turn around in the hotel and find yourself eyeball-to-eyeball with a giraffe you’ll find it a thrilling and surreal experience. Stay here for a few days and such giraffe encounters become oddly normal. 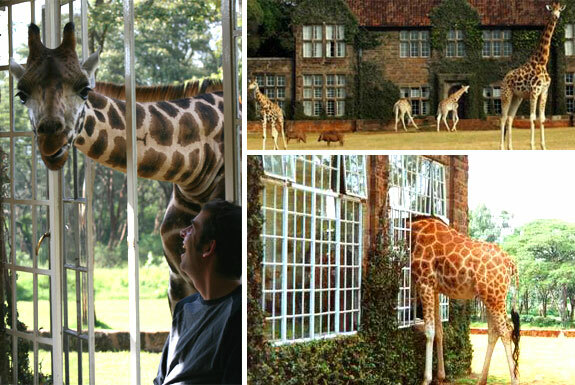 Even if it weren’t for the ubiquitous giraffes, Giraffe Manor would be a wonderful place to stay and it would still be Spot Cool Stuff’s favorite hotel in greater Nairobi. 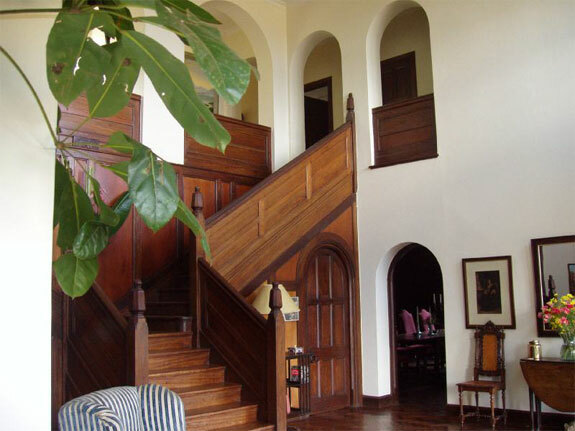 You’ll feel like a well-healed aristocrat residing in this mansion with its log fireplaces, candle lit dinning room and attentive butler service. The room amenities and furnishings are luxurious and stately. 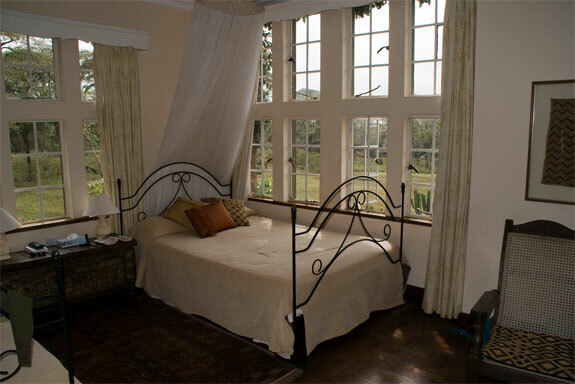 The full board plan at Giraffe Manor costs $360 per person, which is quite reasonable considering that the rate includes all taxes and the entrance into the sanctuary as well as three (excellent) meals per day, an open bar, complimentary laundry service and use of a sightseeing vehicle. 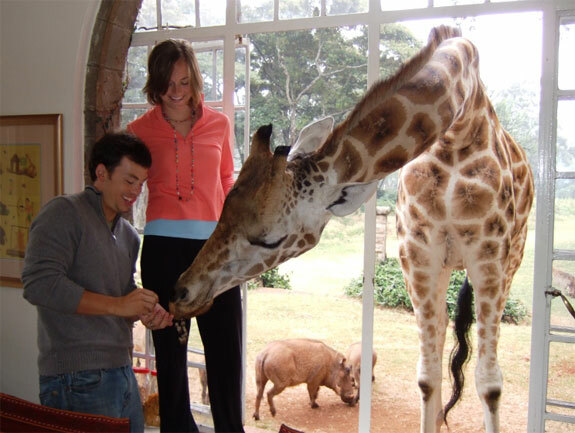 And, besides, where else can you get served a gourmet cup of coffee and ask a giraffe to pass you the sugar? 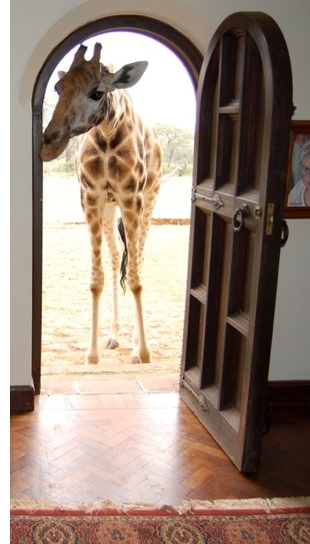 When: Giraffe Manor is closed for the whole of April and May. Open year round otherwise. If you go: There’s nothing special you should bring, or not bring, as far as the giraffes are concerned. All of the Nairobi area can be quite cool in July and August. Family friendly: Absolutely, though most guests stay sans children. I want to visit this magical place for my upcoming 50th birthday. I would be traveling alone. Is it safe to do so? The “Is it safe?” question is always a tough one for us. Different places have different degrees of safety when you look at the situation there in abstract. But the abstract isn’t a perfect predictor when it comes to a specific individual in a specific time and place. Pick whatever “dangerous” place you want and you can find people who travel there safely. Pick whatever “safe” place you want and there’s almost certainly a traveler who has gone there and run into trouble. We can tell you that many women safely travel to Kenya solo. The Giraffe Manor itself is very secure and peaceful. It is possible (though we don’t know for certain) that they’d arrange transportation from the airport for you. If you go, definitely leave a comment and tell us how it was! This is really amazing. I never knew something like this existed. I think I have found one of my new favourite sites! Really good job. Awesome place to be and would definitely be there at least once in my lifetime. Being protective about one’s food is a natural animistic response to another mammal threatening to eat your breakfast. 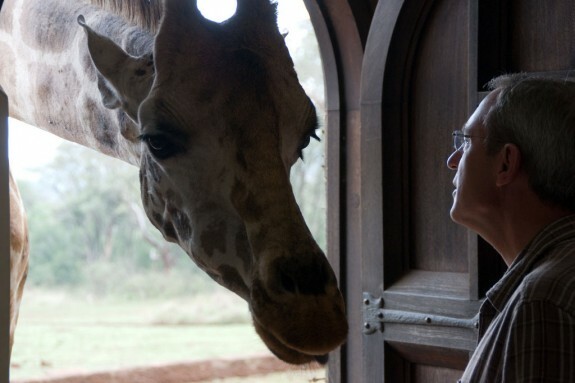 We’d describe the giraffe as very gently persistent. You won’t lose your toast (unless you want to). But it is likely that a giraffe will ask for it. omg!!!!!!! 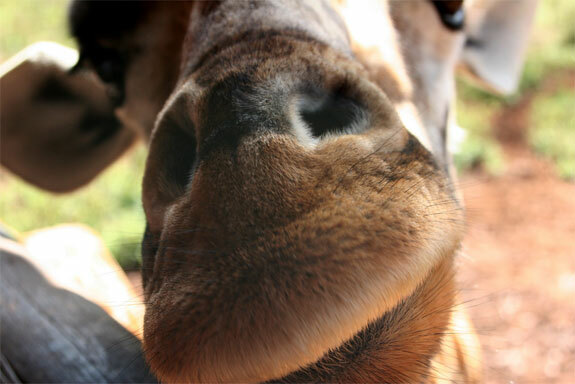 giraffes are like my favorite animals im in love with them!!!! want to stay there!!!! I’ve been aware of this magical place for a long time. And along with the Ngorongoro Crater in Tanzania, I consider these two places to be co-must see stops when ever I can actually get there. It may take a while longer,but I really want to make this happen. I’m really happy to see that things are working out so well. Best wishes. hmmmm . 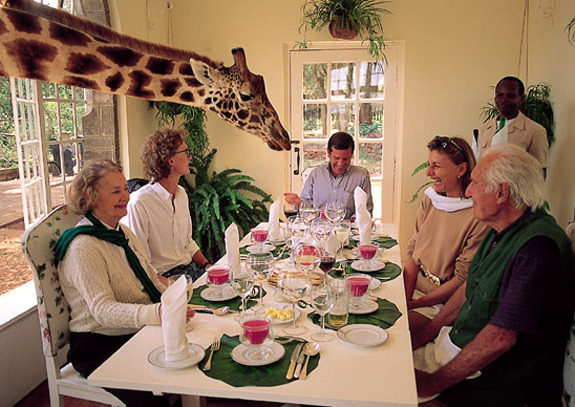 . . i’m not sure I could eat while a giraffe was staring at me. No way! You always come up with the most interesting places to stay. Thanks!